When I was a little girl, my little sister struggles to pronounce my name, Susan. As we grew, she often resorted to simply using her variation - Sue-no. Thus I became Suno to family. 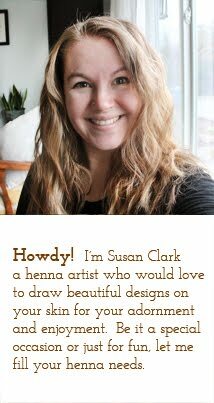 When deciding on a name for my henna business, Suno was a perfect fit and nod to my childhood aspirations of being an artist, as well as bringing something personal of my own to this connective and interactive art. So I am Suno Henna. Suno Henna run by Susan Clark, an artist based out of Chehalis, WA, who specializes in natural henna temporary body art and henna inspired home goods. I was drawn to henna in 2015 for its delicious scent, beauty, history and distraction. The use of the henna plant as a dye has been dated all the way back to the mummy of Ramses II and Cleopatra was documented as using it for decoration as well. Participating in this ancient artform makes the experience all the more fun. As I continue to practice, research and explore henna, traditional Moroccan and Indian designs are my favorite to infuse with modern elements. You can expect to find a mix of modern festival and florals, traditional Moroccan and traditional Indian designs in my books. Suno Henna hand mixes each batch of henna using only USDA certified organic Rajasthani henna powder to ensure a quality and freshness. How did Suno Henna come about you ask? In 2015, my husband and I experienced the loss of our second born son. In the aftermath, I turned to henna for its aromatherapy, for its gentle healing touch, for its beautiful form, new adventure and distraction. As something I'd long wanted to give a turn of hand, I decided why not now. Here we are today; ever growing and developing style and elements. If you have any questions about personal appointments, events, hosting a henna party for your girlfriends or prices. Subscribe to my mailing list for shop updates and exclusive coupon codes!